Stamping Christmas cards and sending them to family and friends is fun, but this year I had another idea in mind. There is no doubt that I now have more stamping stuff than one person should have, especially with a huge stamping score at an estate sale for paper, and then a wonderful gift from a reader of three more boxes of goodies. I wanted to use some of it for a special purpose, and did some cards for our Safelight Project last summer. As DH and I were driving to a Christmas party last weekend, it occurred to me again how blessed I am. I have a wonderful and warm home, a gentle and loving husband, food on the table, and love of family and friends. But there are many who are not as lucky, and they might need a lift at this time of year. It has to be a tough holiday for someone staying in a domestic violence shelter, so I decided to use my stash to create some holiday cards of support for the Safelight shelter residents. You can help too (you don’t have to be a stamper) and I’ll tell you about that in a moment. I found a bunch of these glittery gift tags in the boxes (recognize these, Katie?) and thought they would make great cards. The backs have names on the ‘to’ and ‘from’, but glued down that won’t matter. 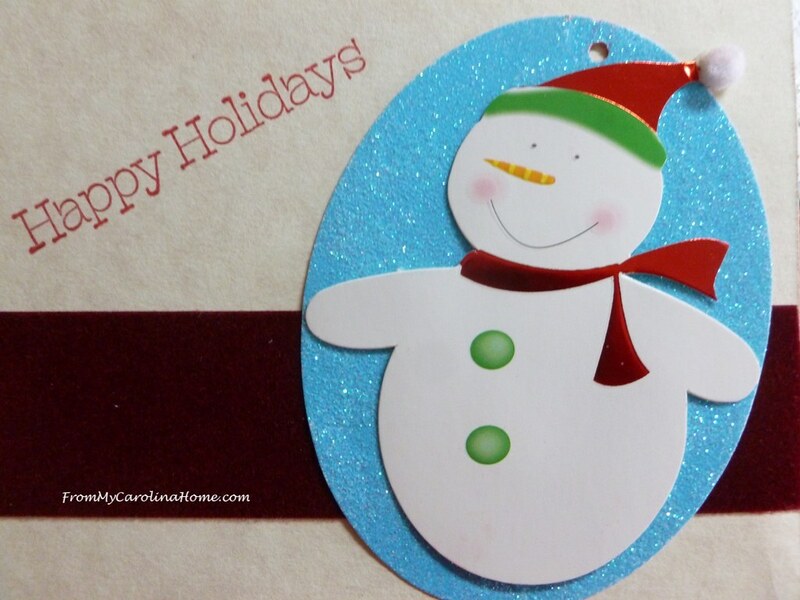 Just a pretty velvet ribbon behind a snowman, or an embossed strip behind a stocking, and voila the card is done. 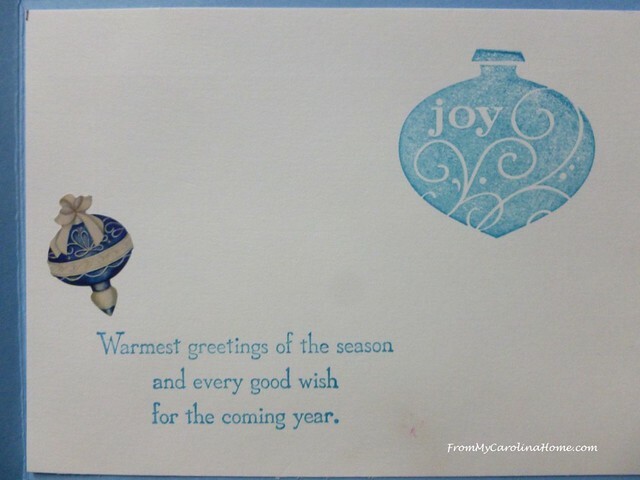 Another card has a larger embossed design, with an ornament on top. These are fairly simple designs, so I won’t go through them step by step. 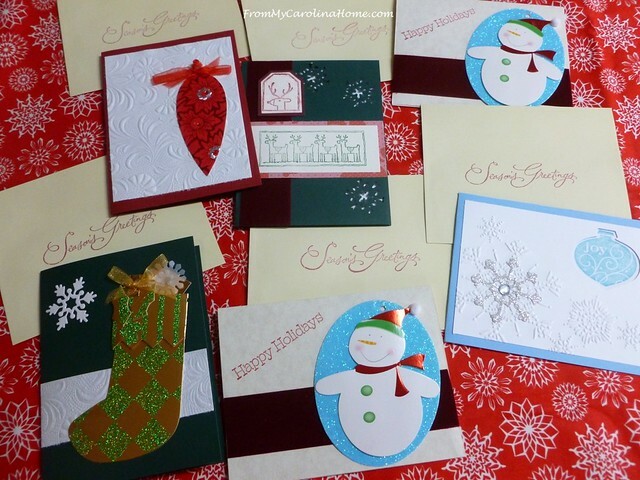 Many of the cards have elements from other cards simply placed on embossed paper. 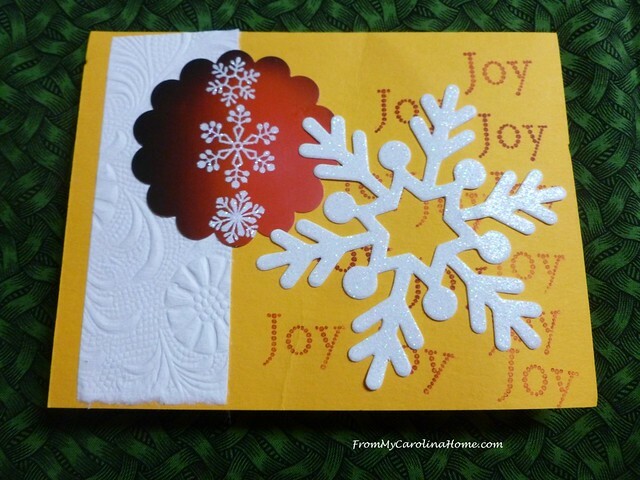 The green on the left is a snowflake design I used several times. The one on the right has a ‘ribbon’ of paper rolled with my peppermint candy wheel. Gift stickers are under the stamped tree. 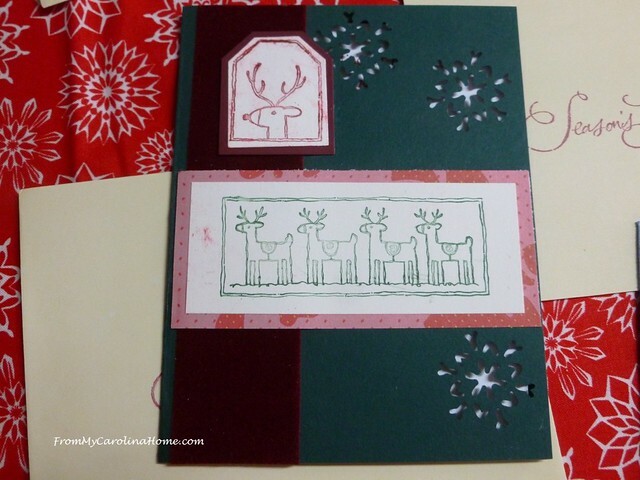 Reindeer stamps adorn this one, with punched out snowflakes. 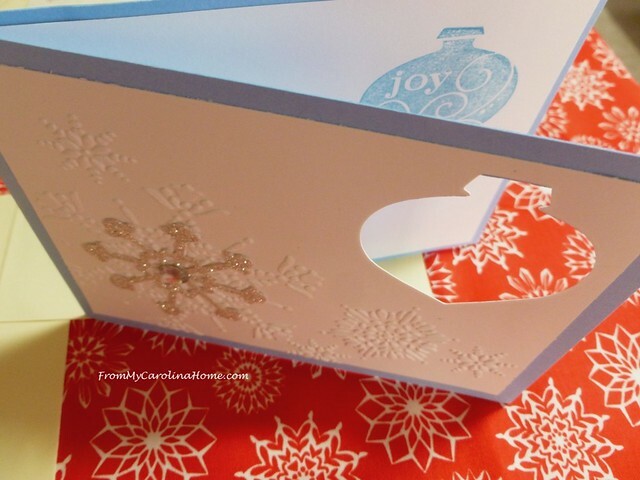 The inside has a white paper for the sentiment that shows through the holes on the front. 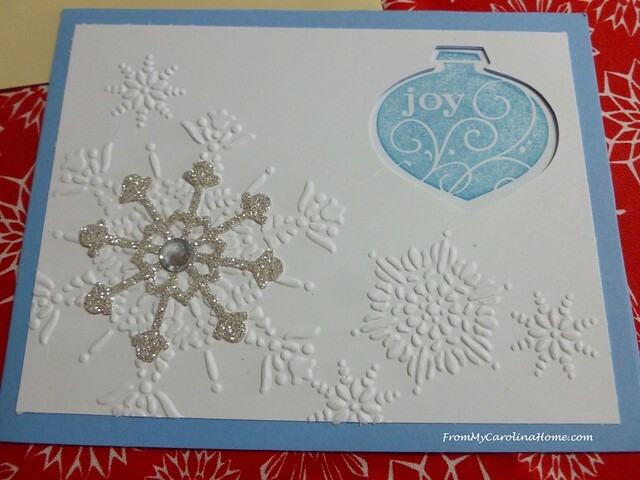 This one has an ornament punched out of the front, with some embossed snowflakes from another card. 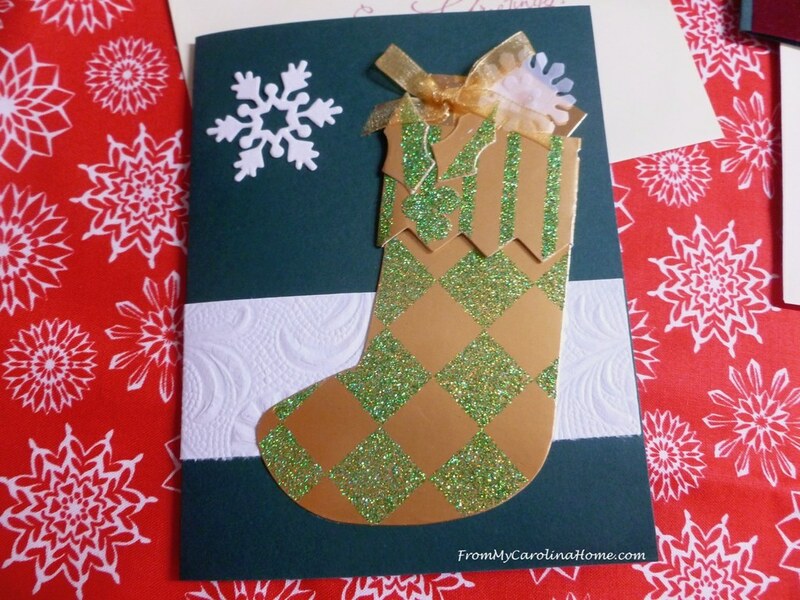 A glittery one is added to the top, then an ornament is stamped so it shows through the punched out part. A view from the top shows it a little better. Inside, the sentiment most appropriate for my purpose is stamped, and a sticker added too. 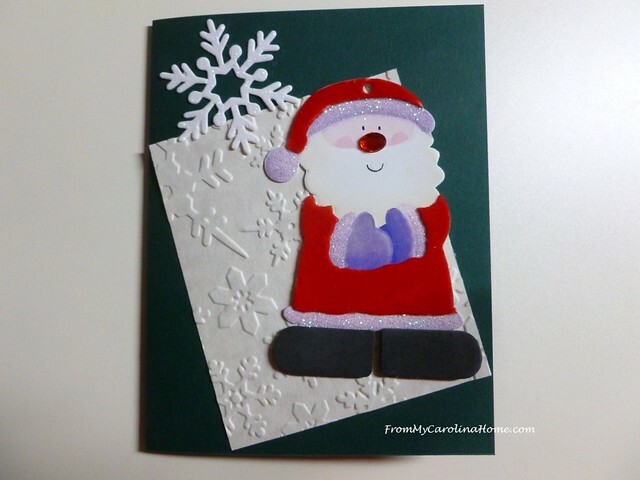 Another tag, this Santa is accented with more snowflakes. 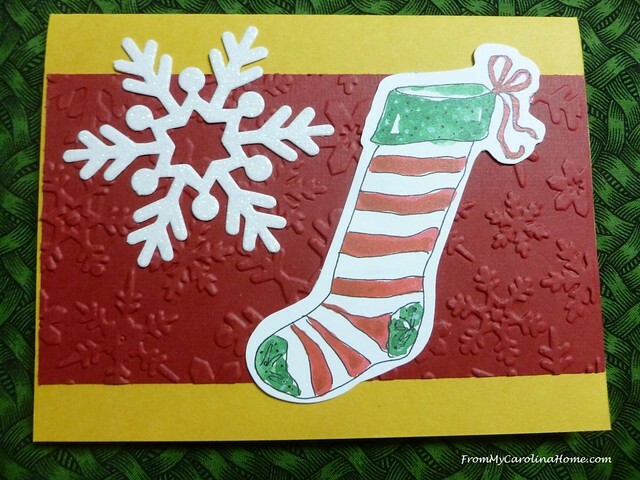 Red embossed paper with snowflakes provide a base for a stocking and glitter snowflake. I had a lot of snowflakes, can you tell? On this one I just stamped the word Joy over and over. 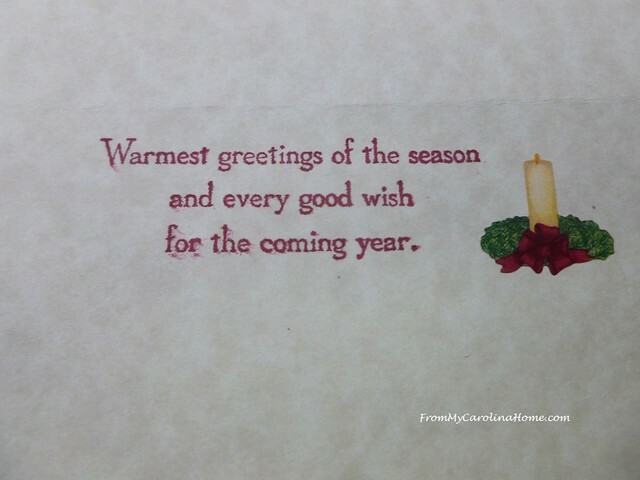 Inside all of the cards, this same sentiment is stamped, with different stickers for fun. I will hand-write a personal message in each one. Now, here is how you can help. There are no prizes this time, only the special feeling of helping someone feel supported this holiday season, to give something to someone that could use a lift, in light of our many blessings. 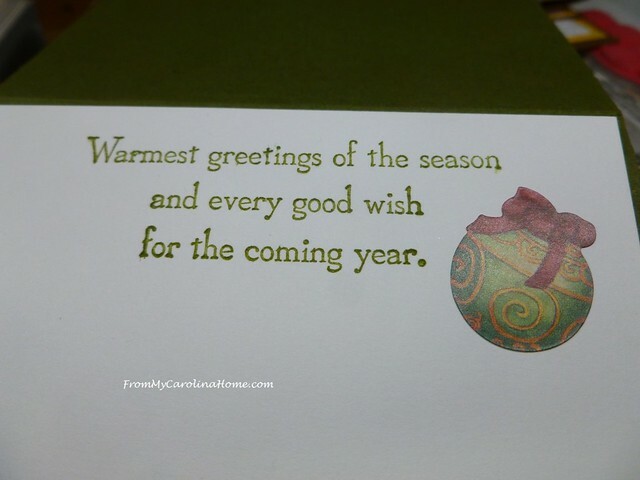 Make or buy some holiday cards, put a message of support inside, and address the envelope only “For you” or “Season’s Greetings” or similar. If you are not a stamper, purchased cards will be just fine, the important part is your hand written message of encouragement. Keep your sentiments to messages of support without a religious component. See the linked post above for more ideas. Can you send a few cards for this project? See the cards sent by readers and the follow up post HERE. 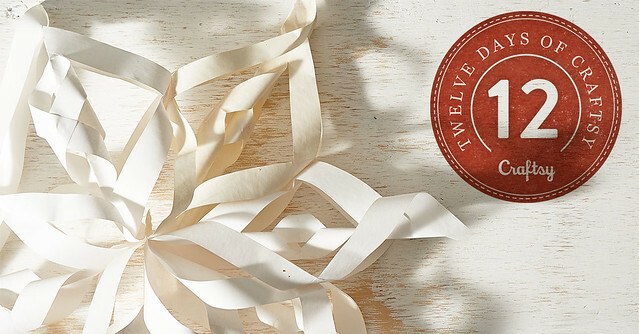 Craftsy is having a Twelve Days of Craftsy Event, click on the photo below to see today’s special offers! Paper crafting classes on sale too! These affiliate links help me support the blog, and using them doesn’t cost you any more. December In the Garden – Snow! The shelter cards are so pretty and cute, I love the blue with the joy in the upper corner, that is my theme now a days. Made a eggnog cookie and the first batch were great the next recipe I tried I’m not happy with , I like the cookies to be soft and chewy. Looked for a good sugar cookie to put the cranberry sauce in like I did last year that isn’t too sweet, found a few so will be trying those. I’m only going to make half the batches to save on supplies till I’m able to find the right combination.Lots to try and do today so have a great day and stay warm. Yes, I can! Thank you for the opportunity to give something that is so inexpensive yet so important. They’ll be in the mail by mid-week. Thank you!! Handmade is wonderful, but store bought is great too. The important thing is the sentiment and encouragement. Oh, Carole….what a generous and thoughtful project. I know you’ll have help from this group too! If I made cards……but I don’t……. The women at Safelight will be very grateful, I am sure. Store bought is fine! I just went back and bolded that part. It is the message inside that counts. I can use any and all!! Your cards are very festive. I like the tags you used and the snowflakes! I will try to send out a few cards early next week. I am low of postage right now and will need to make a trip to the Post Office. 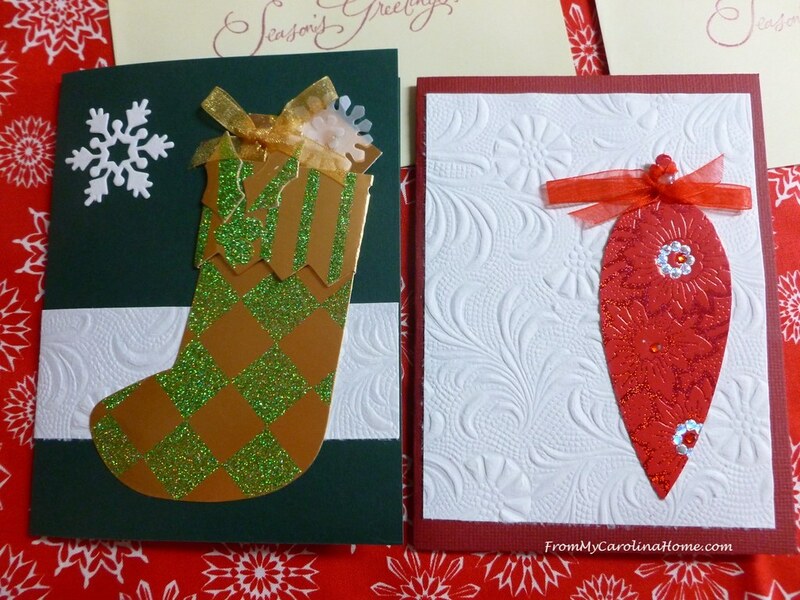 I’m sure many in the shelter will dearly appreciate your beautiful handmade Christmas cards. How very thoughtful. OOPS…..overlooked that I don’t have to make them (my skills would be somewhat limited). I’ll be more than happy to write personal notes on some store bought cards. Thanks for the opportunity to help! This is a thoughtful and generous idea. Good luck with your plans. The cards are adorable and your plan is so thoughtful! I know the cards will come pouring in! That’s a great idea. I can’t promise because I have my last week of school, but if I can get even a couple made, I will send them the 15th. If not, I’ll start making Valentine cards and be ready! 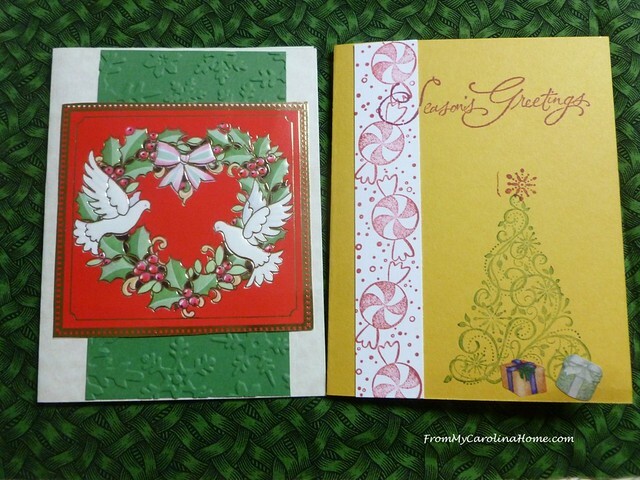 Carole, your handmade cards are so lovely! Thank you for sharing at Vintage Charm!